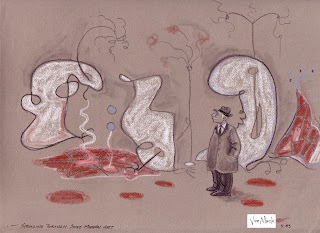 This particular drawing came to mind while I was looking at the Art Institute of Chicago's website and I came across some artwork by Joan Miro, who is exhibited at AIC. Vee Mack's drawings generally demonstrate better draughtsmanship than this drawing displays but I thought that the concept was amusing and the implied commentary worth considering. Are you a fan of Joan Miro, Piet Mondrian, Paul Klee, Jackson Pollock, Willem De Kooning and Vasily Kandinsky? Vee Mack's sketch demonstrates the paradox of an average man viewing images, which represent the nonsense of Dadaism and chaos. It is the overeducated who will look at something that is inherently meaningless and try to find deep meaning in it, while the average man sees it and observes with reasonable common sense that this or that is an absurd waste of time. By the way, while it may appear as though I am favoring one artist for these posts, I am not receiving the variety of artwork that I had hoped for from other artists and I happen to have ample access to much of Vee Mack's unpublished portfolio. Therefore, until I receive other artwork, I will have to rely on what I have on hand. The first thing that came to my mind regarding what the gentleman was thinking was "Mmmm ... What lovely colors ... Now which pocket has my keys? ..."